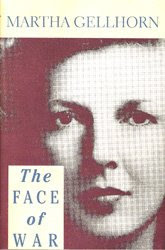 Martha Gellhorn's The Face of War seemed as good a place to start as any. I'd completed the biography and I wanted to know why she was known as one of the earliest literary journalists. Starting in 1937 covering the Civil War in Spain, Gellhorn travelled with troops and assembled reports in the form of features for Collier's magazine. Gellhorn took to war like a duck to water, revelling in the bonhomie among troops. Because the stories (at least up to the WWII ones) were published almost immediately, there's also the 'us and them' element poking through like a writerly tic. You wonder if she always included these lines or whether her editors back in New York inserted them before going to print. In either case, it's off-putting. Her dislike of the "cold, ambitous men" and her sympathy for the undrerdog also blinds her to real drama. Her dislike of the Germans is palpable. Her prognoses are unerringly correct, such as her idea that China would only achieve democracy after (a) universal education and (b) a decent livelihood for the masses, had been achieved. "The French ... are fighting for the honor of France ... they are fighting to get home to a country cleansed of Germans." It's hard to see the difference, in tone and intent, between this kind of guff and Germany's insane policies that had led to war in the first place. Poetic justice, perhaps, but disturbing when coming from the pen of the writer herself. Gellhorn uses direct quotes to great advantage. The first piece, dated mid 1937, is from Madrid. The imagery is natural and unforgettable. Her quoting hotel maids discussing the damage to certain rooms, and the way civilians deal with incessant shelling, are truly wonderful. As she goes on, Gellhorn's reports become less like this, and more like what we can read elsewhere. Which is a pity. Her felicitous phrases are numerous, attesting to her other occupation of novelist. I feel a "vast directed strength" (a phrase she uses to describe the war effort) in Gellhorn's writing. How many generations does it take to result in this kind of thing? But Gellhorn clearly likes being among young, handsome, disciplined and resilient men. Which is not surprising. This is a marvellous book. Cezanne's Bords de la Marne, recently revealed in the old section of NSW's art gallery, is apparently not yet paid for. An email to subscribers of the gallery's mail list tells us there will be a fundraising auction. The $16 million painting is not large, nor is the price. Really it's not when you think about it. Consider the value of real estate in Sydney alone for a moment. It can seem a bargain in this light. Eighty per cent of the cost was from private sponsors, articles last month read. And it had already been moved to Sydney. It's a small and well constructed picture of a river frontage. The thumbnail above shows a sample. In the full image, a punt enters the frame at bottom right. This dynamic is buttressed by a sweeping movement in foliage of the tree Cezanne has placed in the dead centre of the frame. The tree's downward movement sweeps around clockwise, and returns the viewer's attention to a stack of houses receding elegantly at left of frame. The two movements complement each other. The punt moves left and the sweep of tree and clouds moves in concert. The image offers a scene and structure characterised by tranquillity and stability. 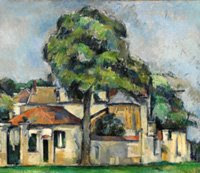 In the left half, stacked houses and trees stand in quiet repose compared to the fluidity of the right half. The pleasant contrast is not inventive. Compared to better-known views of a Swiss mountain and the painter's signature still lifes with oranges, Bords de la Marne is sedate. Nevertheless, careful reconstruction of the material world in terms of what is seen - rather than in terms of what should exist - is Cezannesque. Anyone can go to see the painting if they are in Sydney now. Veer right after entering the gallery. The access portal is last on your right. No postcards have been printed. This is not surprising as it's early. But as Edmund Capon said during televised broadcasts at the time of purchase, it rewards repeat visits. When are road works on Glebe Point Road going to be finished? Current status is that traffic from Broadway to St Johns Road is one way uphill. To those who lived or live in the area it’s certainly a puzzle. For the rest of you, apologies. This post is about an area of personal significance. Not an unusual claim. Thousands … Nay, tens of thousands, may say the like. In a sense it’s a Sydney thing due to Glebe’s ‘iconic’ status. Where else can you live in a standalone, stone house within fifteen minutes’ walk of Darling Harbour? Only Paddington can make a similar claim. But Paddington’s not fenced off like at a rock show. “One working, three talking,” the shopkeeper said to me. It’s been a while, clearly. The cobbled area on Broadway mirrors recent work at Sydney Uni’s Camperdown campus. The grey stone sits well amid overhanging branches poking out from the Moreton bay figs in Victoria Park. Broadway will never be quiet. It’s a stroke of genius to lay cobbles at the mouth of - what used to be, before King Street took off - one of Sydney’s most popular dining streets. The European effect is a suitable counterpoint to one of our more unusual suburbs.